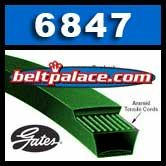 6847 GATES Bladerunner V-Belts: 2L or 4L Section. 47" Length OC. Home > Light Duty V Belts > FHP V Belts. 2L through 5L Sections... > 4L Light Duty V-Belts (FHP) 4L Sections - CLICK HERE! > 4L470 FHP V-Belt. Consumer Brand. > 4L470K Kevlar FHP V-Belt. Consumer Brand. > 6847 GATES Powerated V Belt. Powerated 6847 V-BELT 4L470K Belt. 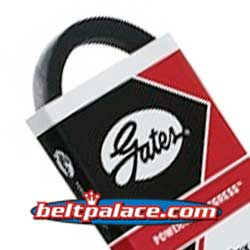 6847 GATES Powerated V Belt. 6847 GATES Powerated V Belt. Kevlar wrapped 1/2" W x 47" Length. GATES 4L470K Kevlar/Aramid L&G BELT. Also replaces 4L470 BELT. 4L470K Kevlar FHP V-Belt. Consumer Brand. 4L470K FHP V-Belt. Aramid/Kevlar Consumer Brand. 1/2” W x 47" Length. Replaces Classical A45K V-Belt on light duty applications. 4L470 FHP V-Belt. Consumer Brand. 4L470 FHP V-Belt. Standard Duty. 1/2” W x 47" Length. Replaces Classical A45 V-Belt on light duty applications.